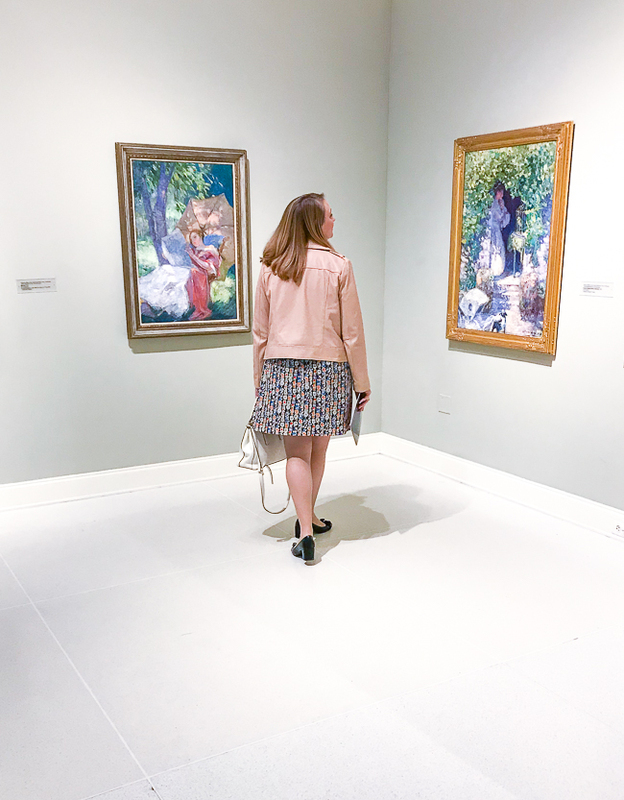 Wander the galleries of the Knoxville Museum of Art and feel inspired by the incandescent paintings of Catherine Wiley with their vivid colors and serene narratives. 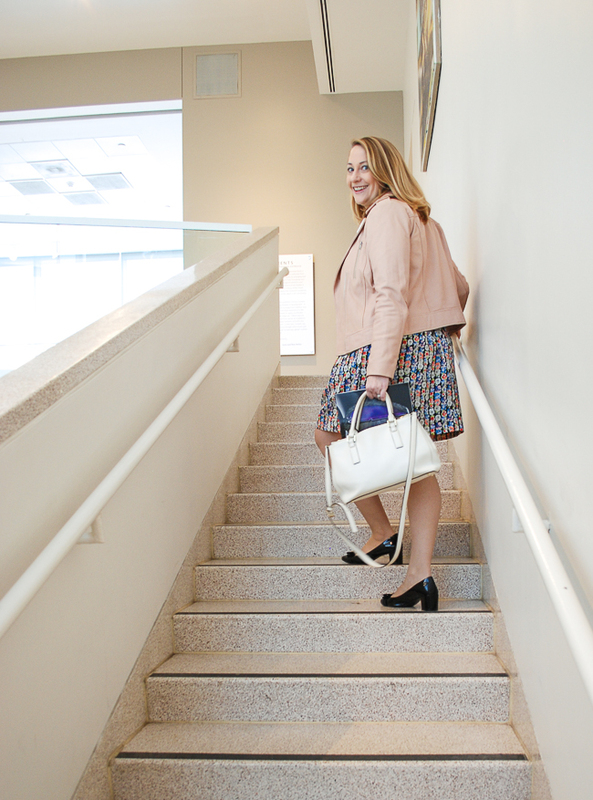 While spring time blossoms and warming temps maybe luring us out of doors, use the next dreary day to head to the Knoxville Art Museum and see the incandescent paintings of Catherine Wiley. I dragged S. to wander the galleries there back at the end of February, and I was pleasantly surprised to see so many of Wiley’s paintings on display in the exhibition Higher Ground. For those of you who don’t know art museums are my happy place and American artists are my jam! 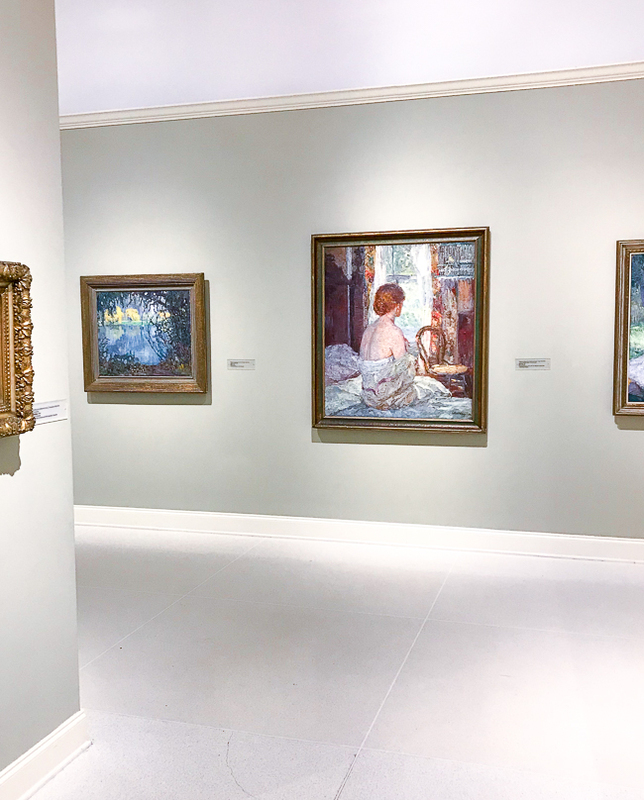 Anna Catherine Wiley (1879-1958) was a notable American Impressionist who brought the luminous colors and sketch like quality of the style to East Tennessee as both an artist and teacher. Growing up in Coal Creek and Knoxville, Wiley was one of the early female students at the University of Tennessee after it became coeducational in 1893. She went on to study at the NY Art Students League with Frank Vincent DuMond and then William Merritt Chase at the New York School of Art. 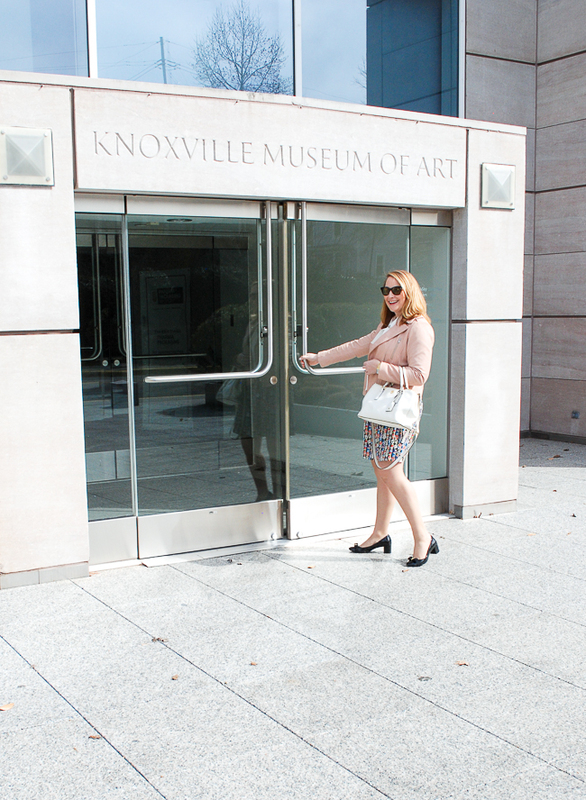 Returning home in 1905, Wiley commenced teaching at UT and working to ferment the Knoxville arts community. 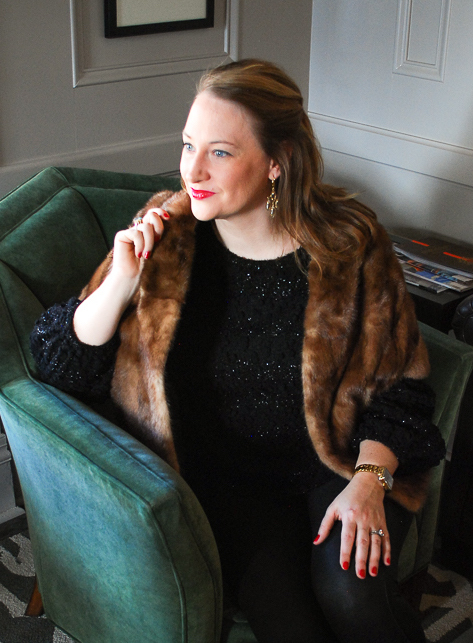 Outfit details are linked on my shop my looks page! At the time of Wiley’s career, women artists had gained significant grounds within the male dominated art world as professional artists. Formal training opportunities were largely available and artist organizations and exhibitions were increasingly accepting women. But it wasn’t easy to shake the stereotypes of female amateurism and feminine expression. The fact that Catherine Wiley claimed two gold medals at the Appalachian Exposition in 1910 for “Most Meritorious Collection” and won the prize for the best Southern artist at the Southwestern Fair in Atlanta in 1917 were significant accomplishments. Wandering through the galleries at the KMA, Wiley’s work immediately attracts and seizes the eye. Her canvases are light filled with vivid colors and bold painterly strokes. One cannot help but be drawn to them, and once your gaze is locked in the narrative details and play in contrasts further entice the mind. “Morning” situated in the center wall to the right of the exhibition entrance is one such captivating work. I was intrigued by the bright play of early light streaming through the window contrasted with the quiet contemplative moment of the woman stalled in dressing with her bare shoulders exposed and face turned away. The contrast is only heightened by the play of shadow down the left side and across her waist. Caught in this moment of reflection or “absorption” as she wakes to start the day, Wiley’s subject is much like the voyeuristic paintings of Degas’ bathers. I couldn’t help but feel part of this intimate moment and wonder what is she thinking and is she happy. To the right of “Morning” is another solo female, this one of a reclining lady in a billowy gown perusing a newspaper in the garden. It suggests a lazy afternoon as the dappled light filters in through the tree and umbrella. Despite the leisurely, fleeting moment and riot of impasto strokes, Wiley’s portrayal of this woman is poised and serene. I think you can feel the artist’s admiration and intimacy with the scene. Both of these paintings have a sort of melancholia to me despite the bold brushwork and wealth of pastel colors. But perhaps I read too much into the works knowing that by 1926 Wiley’s own mental state was deteriorated to the extreme of institutionalization from which she never recovered. It is clear from an essay she composed for the Woman’s Athenaeum in 1912 that she strived to capture the inner life of her sitters: “Only when paintings make us realize more acutely the poetry that lies within us all, the romance that we ourselves feel, the power of our own spirit, the ‘externalisation’ of our own soul, as it were—only then it has a meaning.” Wiley seemed to connect deeply with her sitters, and she captured them with respect and purpose. On an adjoining wall hangs “The Pea Shellers” – a picturesque work that feels instantly nostalgic and Southern to me. Seeking the shade of the porch three women gather around baskets of peas and garden produce to commence the monotonous task of shelling peas. 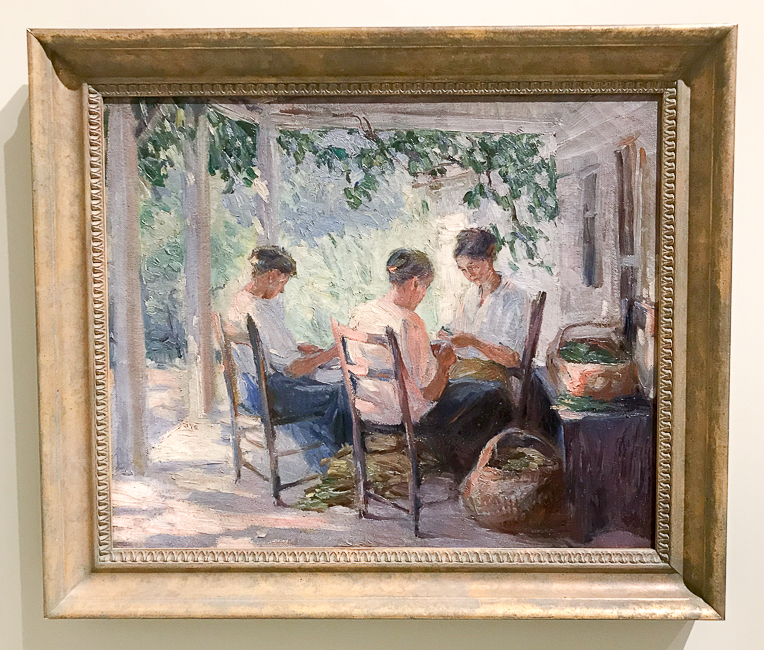 Wiley’s soothing palette and rhythmic use of color creates a harmonious scene, emphasizing the advantages of female companionship and cooperative labor. I spent many a hot afternoon stringing beans with my grandmother on her porch, rocking to and fro with sun warmed planks beneath our feet. Lazy circles overhead stirred up a breeze and shooed away the flies, but it was never enough to break the heat. Swoosh…thunk…swoosh…thunk and the music of fingers flying: snap..ding, ding, ding…snap, snap, snap…ding, ding, ding…. Wiley’s painting brings all those moments back to me with flourish. 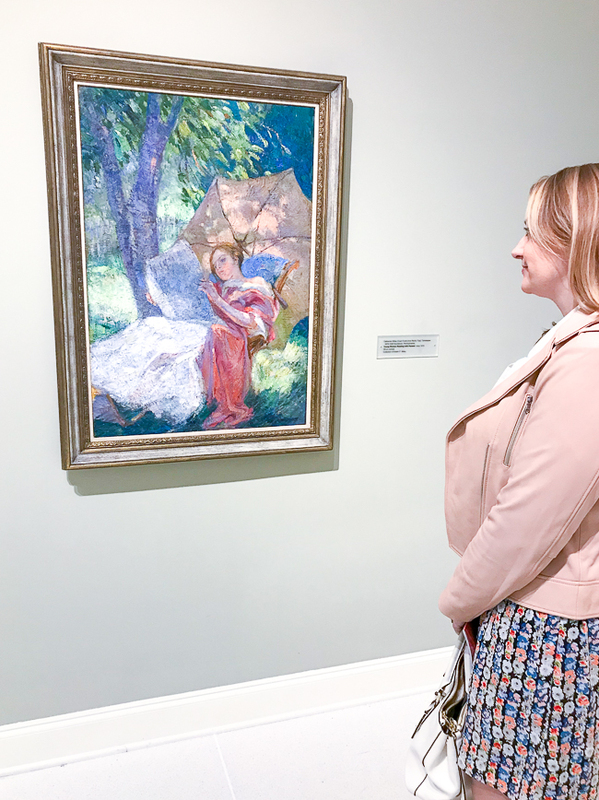 If like me you are a fan of Impressionism and Southern art, I recommend heading downtown Knoxville to visit the Knoxville Museum of Art and soak up Catherine Wiley’s glowing paintings — their vivid colors and serene ladies! You can see more of Catherine Wiley’s work at the UT Library, which has a collection of 150 early works, including sketches, drawings, and ink illustrations. 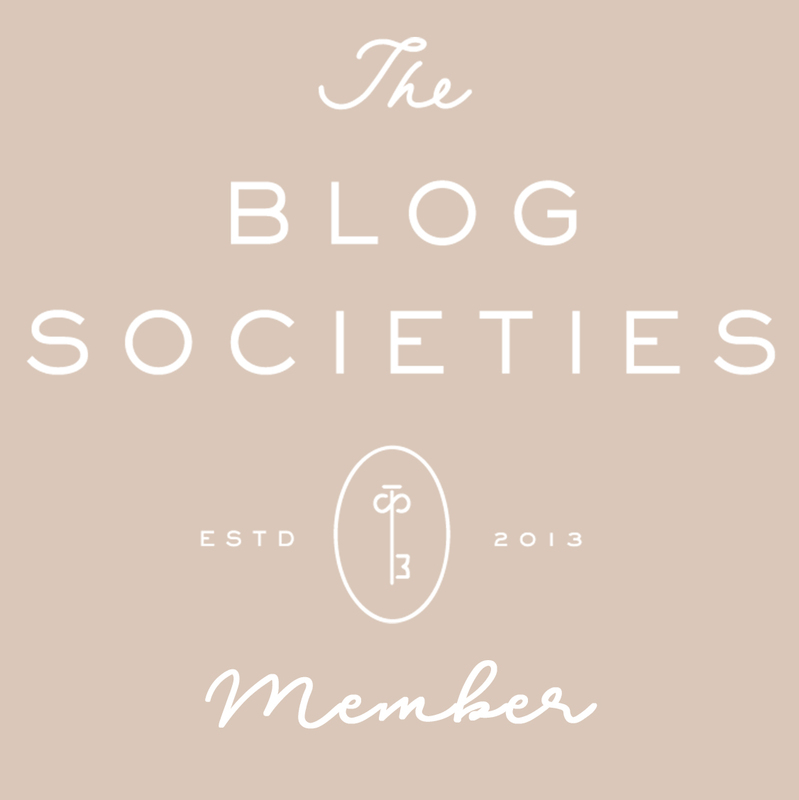 Want to learn more about her life and career? Read this from The New Encyclopedia of Southern Culture and check out these videos on the KMA’s site.